Tom Moore, the chef/owner of Crust Bakery, says meringues make lovely gifts when packaged in pretty cello bags. Here’s a red and white holiday version of this simple sweet. Use the Swiss meringue method for this crispy cookie. Place the egg whites and sugar in a glass or metal bowl and gently mix together, without whipping the whites. Place the bowl over simmering water in a pot and stir every couple of minutes to avoid the whites cooking in the bowl. Remove from heat when the egg mixture reaches approximately 70˚C (warm/hot to touch). Whip in a countertop machine on high for approximately 10 minutes or until the mixture has cooled back to room temperature and is thick and glossy. Continue to beat until mixture forms stiff peaks. Drizzle in the food colouring and add the crushed candy canes. Fold lightly, just to combine, leaving coloured streaks through the mixture. Line baking sheets with parchment and drop or pipe cookies onto the sheet, about an inch apart. 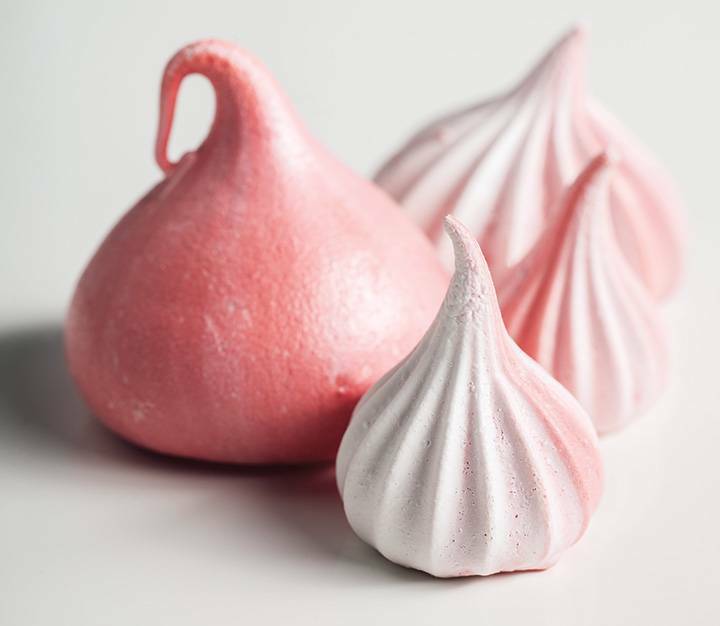 Bake at 200°F for 2 1/2 hours, until meringues are crisp but still chewy inside. Makes about 20 medium-sized meringues.